Amazon Pay Balance Add Money Offer , Amazon Pay Money Offer – Hi Guys , December Is Coming So Comes The Online Sales , Amazon is Coming With Amazon The Great Indian Sale , Flipkart is Coming Up With The Freedom Sale , Also PayTM Mall Announced The Independence Day Sale. Why To Use Amazon Pay Balance? Best Practice To Purchase Any Item From This Amazon Sale is Pay With Wallet Balance , as its Very Quick & convenient Way To Purchase The Lightning Deals In Seconds , Even You Don’t Need to Add The Debit/Credit Card , or Any OTP Hassles. 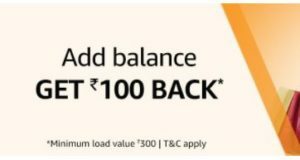 How To Get Upto Rs.100 Cashback On Amazon Pay Balance? 3. Now Just Enter The Amount To Add , You Can Select Minimum Rs.1000 & click on “Other Payment Methods and Promo Codes“. 5. Now You have to Click on “Place your order” and make payment. Amazon Zeta Offer – How To Get Upto Rs.100 Cashback On Amazon Pay Balance? 3. Now Just Enter The Amount To Add , You Can Select Minimum Rs.500 & click on “Other Payment Methods and Promo Codes“. This Offer is valid from 1st to 21st June 2018 (both days inclusive) (“Offer Period”), unless extended or revoked by Amazon, in its sole discretion, without any prior notice and without any liability. During the Offer Period, any customer who loads a minimum of INR 500 into the Amazon Pay Balance associated with his/her Amazon.in account by using the Unified Payment Interface (“UPI”) payment option for such load, (such customer, “Eligible Customer”) will be entitled to receive a cashback of INR 100.